When most people think of salad, they think of boring old lettuce and maybe a slice of chicken on top. It’s no wonder that so many of us turn our noses up when offered salad for dinner. However I’ve found this delicious recipe at the famous bbc good food blog, this salad is not boring at all and is actually very filling and tasty. It uses a special kind of gluten-free grain called quinoa, which is pronounced keen-waa. Quinoa is not really a grain but a seed. However, it cooks like a grain and tastes like a grain which is what makes this meal so delicious. Heat one tablespoon of the oil in a medium-sized pan. Lightly cook the onion and pepper until soft. Add the quinoa and cook for three more minutes. Pour in the stock, put a lid on the pan, and simmer for 15 minutes or the quinoa is soft. Stir through half the parsley. Turn on your grill. Meanwhile, combine the lemon zest, juice, and remaining parsley with the oil. Add a large pinch of sugar and salt. This is your dressing. Using your pre-heated grill, cook the halloumi until both sides are brown and crisp. 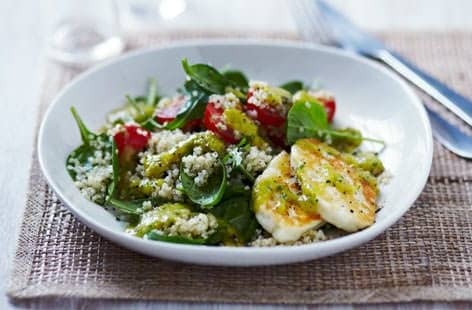 Serve the salad with the grilled halloumi and smothered in the dressing. For more information, check the original recipe here at bbc good food. My favourite recipes for meals, dessert, dinner and for kids . All 100% Free and 100% Gluten-Free recipes here.